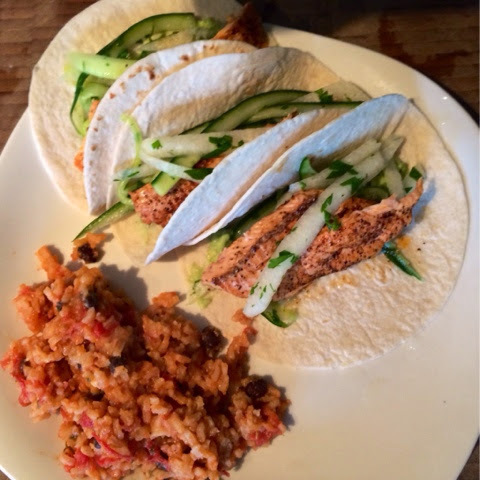 In lieu of Cinco de Mayo yesterday, we decided to make some salmon tacos from the fresh coho caught over the weekend (Thanks Eric). Simple process really, cut skinless salmon into strips, then lightly sprinkle with salt, pepper, chili powder and cumin if you choose. Pan sear both sides in some olive oil. Lauren made a jicama cucumber slaw which formed a bed of flavor on which to lay the salmon. The jicama and cucumber were cut julienne, and tossed with fresh lime juice, salt & pepper to taste and of course fresh chopped cilantro. The tacos were finished with a spoonful of avocado crema, whipped together from avocado, sour cream, a squeeze of fresh lime juice, salt and pepper to taste. The photo shows flour tortillas, I prefer corn, or for all you gluten hating hipsters out there, use a lettuce wrap. Enjoy and felize Cinco de Mayo putos!